Trying to get your cat in a carrier for a trip to the veterinarians or road trip can be extremely frustrating. Some how a 10# cat that should easily slip through the door/opening of the carrier is all extended paws, biting teeth and razor sharp claws...that is if you can even extract it from under the bed once it sees the carrier. Before the cat knows what you have in mind, scoop the cat into an empty pillow case. You can then deposit the 'cat in the bag' into the carrier or wrap a cord around the top as a soft sided carrier. Most cats will settle down on your lap in this contraption but be warned...if the cat gets 'pissed off' at you, you could end up with a wet lap. Never transport a cat or dog without being in a carrier or secured to a seat belt via specially made restraint devices. Pets can get under your feet and lead to an accident or become flying projectiles if you have to slam on the brakes. Pets escaping from the car and running into the street can have deadly consequences. Another option for a carrier is to get one with an entry door in the top as well. That is what I use. It is large enough, and with the help of gravity, I can just drop my kitty in from the top. It also makes it easier to get her out at the vet's. oh yes, getting an unwilling cat out of the carrier at the vets...how fun!!! After getting out the carriers, I sneak up behind my cats with the pillow case and never have to have a fight about taking them to the vet. They might not want to come out of the carrier at the vet, but when it's time to go back home, there's no pillow case or anything else needed: They walk right back in! Thanks, Dr. Cruz for validating the pillow case method--I had a "friend" who didn't know how fight-free a method it is, and assumed the worst--He was so wrong. I've often had to resort to holding the cat gently by the forequarters and lowering them hindquarters-first into the upended carrier. It works better for my 15 pounder. Funny how it looks like he'll never fit, but then at the vet's he barely takes up half the carrier as he huddles way in the back! I have a soft sided carrier for my very big boy cat Charlie. He's long and weighs 13 pounds. I used to have a smaller carrier for my cat Samantha but he quickly outgrew that one by the time he was about 5 months old. The carrier I have has two openings, one zips at the top and the side also zips open. He will sometimes sleep in his carrier but getting him inside the carrier can be an ordeal. I usually put him in from the top, push him down and quickly zip the top shut. 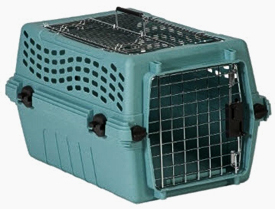 I've seen soft sided carriers with wheels that stroll along like a carry on suitcase and that's what I think I should have gotten for Charlie because the carrier is heavy once he's inside. There's nothing better than a warm fuzzy hug from your pet! This used to work but now I cannot use this method. I have posted Anuck's story, He had surgery for intestinal blockage and had to return to the vet every morning and come home at night, he now hates his carrier. I bought one large enough to provide him some room for movement so he isn't stuffed in it with no room as I have seen a few times at the vets office. He had an 8 1/2 incision on his belly and I do not want to hurt it, how do I get him into his carrier, he hates it with a passion? Didn't know they made these, mine is just front opening. I adopted my cat two years ago, when i have to go to vet for cats rabies shots this has been twice. I put the carrier on my couch Grady is very inquisitive and walks in lays down. I have been very lucky because he is familiar with it, I seem to have no problem.